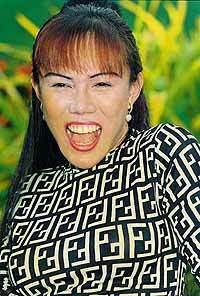 Dengue Fever - again and again and again! At the time of writing this column, there are four westerners in my hospital with Dengue Fever. These are not an isolated group that caught it from drinking out of damp glasses in the same bar. Today’s daily newspaper also had an item quoting 180 cases in Northern Thailand and 10 fatalities this year. That’s more than died from the SARS epidemic that had people cringing in their homes afraid to go out without a gas mask. So, despite my previous pleas (and those of the Public Health Department), Dengue Fever and its potentially fatal variant, Dengue Haemorrhagic Fever (DHF) is still with us. The latest figures have now prompted me to repeat my advice on this subject. If you remember reading about it before, I apologize, but the subject matter is very important. This is an important ailment, that can be avoided. Like Malaria, the virus is carried by mosquitoes, this time by one called Aedes aegypti. The virus itself is related to Japanese encephalitis, Murray Valley encephalitis and Yellow fever, and there are four “serotypes” or subgroups of it. The mosquito lays its eggs in water containers, preferring the clean water found in water tanks and pots, in the saucers under pot plants and even under the pet’s food dish. Inside discarded car tyres is another favourite spot. These mosquitoes are not of the adventurous type and feed during the day and spend their time within 200 meters of their hatchery. Consequently, the eradication of any local breeding areas becomes very important towards maintaining your own health, as you can see. Keep your home free from lying water for a radius of 200 metres and you’re looking good! On the other hand, Dengue Haemorrhagic Fever can certainly be fatal! It appears that Serotype 2 may be the culprit here, but does not usually produce DHF unless you have been previously bitten by types 1, 3 or 4. In addition to the symptoms of Classical Dengue the skin begins to bruise very easily as the blood haemorrhages into the skin. Children are also more susceptible to this than adults. This also becomes much more of an emergency and is best treated in the Intensive Care Unit (ICU) of your favourite hospital. With our ability to treat the viral ailments being very limited, the defence against the Dengue virus lies in the preventive measures. The other precautions are to wear long trousers and long sleeved shirts, especially at sun up and sun down, when the mosquito is at its most ravenous. The other factor to remember is “D” for Dengue and “D” for DEET. DEET is the magic ingredient in mosquito repellents, so when you go to buy some, check the label - if it has DEET, then get it. And then remember to use it! I am looking at buying a house in Thailand because the market is depressed and should be a good time to buy. I have been married for some time now to the same woman and will put the house in her name, as I don’t need the hassle of lawyers and phony companies and all that, but my mates from my favorite watering hole all say that I’m crazy. What is your feeling? We have been married for seven years and have two kids plus one of hers from a previous marriage. I read all the time about men who have been ripped off here in Thailand. It is very difficult for me to answer this, my Petal. From what you have written, it does seem as though this is a strong bond, but people can change, or hide their true feelings. This would be the same if you were talking about buying a house in someone else’s name in the US or the UK, or anywhere else for that matter. It is a measure of trust, and only you know if you can put that trust to the test. I am aware that I get many writing in complaining of being ripped off, losing houses, cars, gold and motorcycles, but that does not mean that this happens all the time. You should also take into consideration that it is only those who have been disadvantaged that write in. Others happily living in marital harmony don’t need to write to an Agony Aunt, do they. There are ways of safeguarding your investment, but you need to talk to a lawyer, not me. Best of luck, House Hunter, and I hope you will be one of the happy ones. You sound like a nice person. When you’re ready for the second house, let me know and I’ll send up photocopy of my ID card, so you can spell my name correctly! A lot of women in the local shopping center seem attracted to me. They sit on the benches and call me over and want to talk with me, and some even promise me Thai lessons in return for me giving English lessons to them. Only thing is they all want me to take them somewhere for these lessons, they’re not prepared to just sit on the bench and get them. “I go with you,” is what most of them say. I am getting a bit leery of these requests, as I don’t want to waste my hard earned cash, and it sounds all a little too commercial for me. Do you think it’s my aftershave, or maybe my pheromones? You are a cunning linguist, aren’t you, Petal! Making sure you keep the cash! But perhaps your aftershave is clouding your vision, and the pheromones unsettling the function of your brain. I doubt very much that these are language students thirsting after knowledge, but rather they are short-time students thirsting after money. A conclusion that you are slowly coming round to, but it is certainly slowly. You can almost take it as 100 percent true, that ladies on shopping center benches are not there to spend money - unless it’s yours! You should look for some real enthusiastic amateurs to practice your linguistic skills. This a somewhat delicate problem, but you should understand more than most about the relationships that men make when they are not living here, but are only here for a few weeks at a time and then back to working in the sandbox. I am a single man, and on my trips here I generally find that there will be a young lady who will indicate that she would like to “I take care you”, and a suitable arrangement can be agreed on. This is great for a bachelor like me, but I also want to play the field a bit too. One young lady has really begun to sink the hooks into me, and I can see a problem coming up, because I own my own condo here. How do I get her to understand that this is not a lifetime relationship, and when I go back to work I will want her to leave the condo? I have four weeks left, Hillary, so a quick fix will be appreciated. You know what you have just proved, Petal? You can’t have your cake and eat it too! The way around this problem is to bring it out into view and it will cease to be such a worry for you. Since Hillary doesn’t know how good your Thai is, it may be better for you to have an interpreter, as it is important the young lady understands the situation. And understands it right now, not two days before you leave. She has been taking care of you, so now you must take a little care of her and her feelings. Now is the time to spell it all out, my Petal. But do it gently, that’s a nice Sandboy. Why do we take so many pictures of people? Ever stopped to wonder? We like them, we love them, we want to remember them, and so the list goes on. It makes no difference, ‘people’ shots are what we take 75 percent of the time. Now how many of your people shots are great? How many are average? And how many are just OK and get left in the drawer? For most people, their people shots tend to be of the last category. However, do not despair, this week here are the 10 golden rules, so that you too can get results just like the local “professional” photo shop. It doesn’t depend upon what type of camera you have, it just needs you to do a little planning. Rule 2. If you have a camera with a “portrait mode” then use it! This is one area where I agree with the manufacturers. The portrait mode with modern cameras does work. It maximizes the settings to produce the most pleasing effect, gets rid of backgrounds and sets the exposure to allow for the best skin tones. Use it. Rule 3. Use the flash in daylight. If you have a fancy camera with “Fill Flash” facility, then turn it on and you will see the prints you get back from the photo processor have now got sparkle and punch. If you have not, but have a flash you mount on top of the camera, use it, and select around f2.8 to f4. This will not overpower the daylight, but will give catch-lights in the eyes. Rule 4. Look at the backgrounds. It is so easy to concentrate so hard on the subject that you do not really “see” the background, which can be confusing and cluttered. Try to keep the subject as far away as possible from all backgrounds and if you have manual mode or aperture priority mode, then set the aperture f stop at around f5.6. Rule 9. Super trick! Use a gold coloured reflector to give the skin that healthy glow. Just glue some gold wrapping paper to a piece of cardboard about 1 meter square and get an assistant to move it so it reflects “golden glow” into the subject. This is particularly flattering for pale skinned folk. Follow those 10 simple rules and you will notice a marked difference in your portraiture. From last week: … borrowers will now ONLY lend 95% of asset value to borrowers who aren’t prime and in many cases can’t/won’t document their income. Not only were they lending 100% to this category before, in many cases they were lending more than 100%. The assumption here seems to be that lending 100% today to non-prime borrowers (remember that the importance of the security or the loan to asset value becomes more significant as the credit status of the borrower worsens) will be Ok because the loan won’t go wrong and if it does then in a year’s time the asset will be worth 115% of today’s value, so a 100 or 105% loan to value doesn’t constitute risk. Consumers borrowed 100 percent of their home’s value on about 18 percent of Alt A loans (loans between sub prime and prime) made last year, according to Bear Stearns, the largest mortgage-bond underwriter. Another 16 percent had loan-to-value ratios above 90 percent as well as limited documentation, they say. The actual lenders themselves aren’t concerned about risk because after all they’ll sell it on soon enough, but what’s forcing them to change their criteria is that the market no longer wants to touch these riskier loans or at least a smaller number of interested buyers will be paying the lenders much lower prices for them. It’s the fact that Bear Stearns Cos., General Electric Co.’s WMC Mortgage, Countrywide Financial Corp., IndyMac Bancorp Inc., Goldman Sachs Group Inc., Lehman Brothers Holdings Inc. and Credit Suisse have all said in the last two weeks they’re pulling back from buying Alt A mortgages sold with no down payment or in a refinancing of the house’s entire value that is forcing the lenders to adjust their criteria rather than the fact that there will be huge defaults. If you don’t plan to own the loan book yourself you don’t care how it performs, as long as you can sell it. Anyone who can’t see the madness of that line of thinking probably shouldn’t be allowed out on their own. Last year the Alt A category accounted for about 20 percent of the $3 trillion of U.S. mortgages, about the same as sub-prime loans, up from 5% in 2002 according to Credit Suisse Group, highlighting where much of the growth in US lending has occurred. Tighter lending standards may slash sub-prime mortgage sales in half this year and Alt A mortgages by a quarter, according to Ivy Zelman, a Credit Suisse analyst in New York who covers homebuilders. The new requirements will force some prospective homebuyers to save more money for a down payment or risk being denied credit - the boom in the US property market has been fired by: 1) people and corporations being able to trade up properties and acquire properties more readily because these have been more affordable at such low interest rates; 2) people who will be able to obtain credit at some point but should currently be saving up their deposits being offered deposit free terms now; 3) people who by any logical commercial criteria shouldn’t really be able to currently obtain credit of such magnitude being offered it left, right and centre. All of this has compressed future demand - those without deposits and whose incomes aren’t yet sufficient to service the debts or whose circumstances aren’t sufficiently robust to ride through any short-term financial storms have been given credit that will in many cases lead to defaults, repos, and damaged credit, and instead of providing an economic boost, this will become a major economic drag. The category comprised about 5 percent of new loans in 2002, according to Credit Suisse. Late payments of at least 60 days and defaults on Alt A mortgages have risen about as fast as on sub prime ones, to about 2.4 percent, according to bond analysts at UBS AG. What a surprise - people refusing to document their ability to pay are maintaining their loans to a similar standard as those with documents signifying poor ability to pay. Loans in the category made to borrowers with low credit scores, equity and documentation are doing about as badly as sub prime loans, according to Citigroup Inc. and Bear Stearns analysts. Rapid credit tightening that’s “been isolated to the sub prime world has really migrated’’ in the past two weeks to Alt A offerings that involve borrowing nearly all of a home’s worth, said Brian Simon, senior vice president at Mount Laurel, New Jersey-based mortgage bank Freedom Mortgage Corp. Bear Stearns will finance 25 percent to 30 percent fewer non-prime mortgages this year as it tightens credit, Chief Financial Officer Sam Molinaro said on the company’s earnings call recently. 1) The market will continue to slow because the artificial stimulation of loans to people who won’t (or in the case of Alt A probably can’t) service them is going to be taken away. The market will weaken, asset values will continue to fall, better quality credit will start to suffer and defaults and repos will become more widespread. Credit will tighten in this slowing market, causing it to slow further, asset values will fall further, even better quality credit will start to suffer and defaults and repos will become even more widespread. the market will weaken even further, etc., etc. This is a difficult spiral to get out of until the market finds its floor and we don’t believe that Pimco’s Bill Gross is right in his assertions that aggressive rate cutting now can help to stem this spiral. 2) Lenders will be stuck with debt that they can’t sell profitably - many will suffer losses. Apart from the further contraction in credit that this will cause, the problems will filter through the financial system until the likes of Bear Stearns, Goldmans, etc., find their own books severely tested. We believe that there will be further corporate casualties in this market - we’re just not sure how many or how big. This could ultimately be an even greater problem than the S&L crisis and the impact on the general economy could be catastrophic. The bottom line is that in the UK and the US too much money has been thrown (almost literally) at sectors where the growth has been too hot for too long with no regard to what will happen when the trend turns. This is also true in varying extents in economies like Ireland, Spain and Australia. What can you do to protect/profit from this? That’s easy - Property Protector is an insurance product that protects the value of existing properties or an investment product that allows investors to gain from the falling price of properties. Which version you require depends on your circumstances but I can’t imagine that there’s anyone out there who shouldn’t be at least looking at this in some format. At the risk of wishing my life away, I am striking days off the calendar with unusual enthusiasm. The count down is towards two events. The furthest away is my return to Chiang Mai. The earlier date, a few days after this appears will be the arrival of my Thai friend to England for a first ever visit outside Asia. We have travelled extensively in Thailand itself and to Laos and Vietnam, but this will be his first ever intercontinental holiday. The task is to fill the three weeks with a sensible and rewarding mix of social, tourist and cultural events. The visit will include a few days across the channel and, naturally, a trip to London and some period around the south coast and its wonderful beaches and countryside. Since it is not something to be repeated often it must be a success. Speaking of travel, I know that an increasing number of residents in Chiang Mai have been crossing to Burma, or Myanmar as their fascist Junta will have it. This is a difficult decision since their regime is on a par with those of Zimbabwe and North Korea, in its treatment of the population and of course, their elected leader Aung San Suu Kyi has been under house arrest for years. She supports a boycott, just as we boycotted South Africa when I was young. It is a personal decision and many people think that isolating the Myanmese people is no help. If you are thinking of travelling there check out Voices of Burma website for advice on travelling both ethically and ‘privately’ rather than through a conventional agent. They can be found on www. voicesofburma.org and try to benefit the ordinary people not the monstrous generals. And mentioning both travel and dubious leaders you might be interested to know of George Bush’s travel arrangements. To look after him abroad he relies on a staff of 800 and some 100 bodyguards. This is for each country he visits so this will have trebled for the recent sorties to Germany, Italy and Albania. In addition to a special limousine and a back up limo that are sent ahead, along with private helicopters and refuelling trucks, it is difficult to imagine the carbon footprint engendered by one such trip. His support of methods to reduce global warming is presently reducing parts of America to a dust bowl reminiscent of the depression era. There was an American business man on the radio this week that has a way of getting through a trying day or an especially difficult meeting. He has had a large sign placed outside his office and this has the running total of how many minutes Bush has left as President. As he leaves the office he glances at the diminishing total and this gives his spirits a lift. Finally, just an advance note about a novel I am reading should be of special interest to readers of the Chiang Mai Mail. I have read many books set in Thailand and who can forget Graham Greene’s classic set in Vietnam, The Quiet American. But Colin Cotterill’s debut The Coroner’s Lunch is the first story I’ve found set in Laos. It is the first in a projected series featuring a wonderfully quirky character called Dr Siri Paiboun. So far I am only a third of a way through this wry thriller and more comment follows next week. I discovered (via the book jacket) that the author teaches in Thailand and is a resident of Chiang Mai. At present the book is only available in hard back (published by Quercus) but it may still turn up at the local bookshops, so look out for it. The Pang twins, Oxide and Danny, born in Hong Kong, but often working in Thailand have built quite a reputation over the last few years. With films like The Eye and Bangkok Dangerou,s thrillers and horror films seem to be their favourite genres. The rather scary looking cover of Recycle, and then the red opening credits over bleached scenes of urban waste seemed to confirm that it was a horror movie. And in some ways it is as there are plenty of disturbing moments. The story involves a successful novelist, Ting Lin, who after three best-selling love melodramas loosely based on her own life, is looking for an idea for her next book. As she works in her large and rather gloomy apartment, she starts to feel haunted. The camera starts tracking her in the way familiar from horror movies, revealing one’s vulnerability even within enclosed spaces as things lurk in shadows and around corners. She finds strands of long hair that is clearly not her own, receives strange and alarming phone calls, and sees phantom shapes. A shower scene inevitably brings Psycho to mind. As all this happens to her she draws on it for her book, testing out ideas and then flinging discarded drafts into the bin. She is drawn towards the building’s lift and there meets a corpse-like old lady and her grandchild who sink into the ground as the lift descends below the bottom of the shaft. This leads us into increasingly oneiric sequences of decomposing zombies and decaying cityscapes, the sort of interspaces one glimpses between crowded high-rise buildings, magnified by means of computer manipulations, and then drained of colour for maximum effect. Ensor-type staircases lead nowhere, a great funfair gondola swings overhead and ruins lie all around. Clarification now comes: Ting Lin is in the world of abandoned ideas, existing in their special limbo for recycling. She passes through nightmare forests, junk yards of forsaken toys and intentions and a library of forgotten books. She crosses a dangerously narrow bridge with the dead slowly crossing. As one watches one should allow oneself to associate freely: I have already mentioned being reminded of Hitchcock and Ensor, but many more references came to mind: T. S. Eliot’s Wasteland [the bridge and broken images], Lord of the Rings [the unstable bridges], The Wizard of Oz [the tornado which carries them away from disintegration], Borges’ universal library, Don’t Look Now [ the little red figure], Dante [the journey through hell], Matrix [the pixellating hands], and a great many more. Because this is the point: post-modern culture consists of the recycling of the ideas of the past. 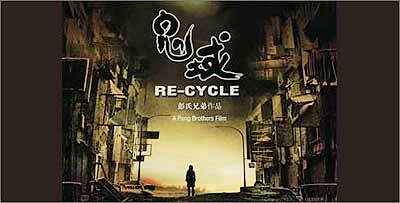 Every writer, like the main character, and every director, like the Pang brothers, is in the recycling business. This phantasmagoria is a journey through our cultural memories; the horror film has become an allegory and also a fairy story, a fantasy journey through our fears and ancient dreams. This film tries to be many things and that is risky. If you want horror, it is diluted by other interests, but if you fancy letting your imagination roam in some rather gloomy places this is a worthwhile place to start. Ploy: (Airport Plaza only) Thai Drama – From director Pen-ek Ratanaruang. I urge you to see this fine Thai film examining a marriage seven years on. It’s an assured piece of mature filmmaking with much that reverberates. It’s been censored, but the film remains strong. Essentially a lucid dream, Ploy takes place in that odd in-between state when you cannot be sure whether you are sleeping or awake, and there are seemingly sure pointers that lead you to believe both. While things appear straightforward in the early stages of the film, it soon becomes clear that some sequences are in fact the dreams by some characters about the others, and the lines between what is real and what is imagined becomes deeply blurred. This is very likely the entire point of the film. Ploy isn’t really a film about what is, so much as it is a film about what might be: about the different paths a relationship might take, about how we may choose to either support or destroy one another. Both paths are equally valid, both are equally likely, and it is up to you to decide which you choose to follow and label truth, and which you choose to label fantasy. Don’t miss it. Thai cinema doesn’t offer something this good very often. Fantastic Four: Rise of The Silver Surfer: US Sci-Fi /Fantasy /Action – Live action, based on the Marvel comic. Now, after this primer, you’re ready for your first viewing. In the advanced course next week we’ll delve into the Silver Surfer himself and discuss why this basically good guy is doing so much evil, and discuss how the entity Galactus, for whom he once worked, relates to God. (Preview: Galactus is older than the universe itself, being the only survivor of the universe that came before our own.) Very heavy cosmology in this movie! Ocean’s Thirteen: US Crime/Comedy – Casino heist caper. A delightful patchwork of plot-holes laced together with beautiful fabrications. The crew pulls another con all the while engaging in the banter and quick give-and-take dialogue that fans of the series expect. Much fun. Generally favorable reviews. Teng Nong Khon Ma Ha Hear: Thai Comedy – Starring two popular Thai comedians. Not for farangs, but number one at the Thailand box office during the first June weekend. Sick Nurses: Thai Horror – Whimpering, simpering and screaming pretty young nurses get killed in imaginative ways. Bloody awful to gauge from the trailer. Strictly for aficionados of bloody awful Thai horror films. Arthur and the Minimoys (Invisibles): US Fantasy/Animation – Part live, part animation. A boy (the extraordinarily gifted child actor Freddie Highmore) sets out to save his family home from swindlers, find his missing grandfather. He must follow ancient clues to a vast treasure, and unlock a passageway to a spectacular world. About five years ago, after a very bad motorcycle accident in America when a drunken woman hit me head-on and left me to die on the side of the road (hundred-mile-an-hour impact, broken neck in two places, severed artery to the brain, fractured hip, fractured foot, etcetera, etcetera) the doctors stapled the foot back together so they could concentrate on dealing with the rest of my body parts. My right foot is still just a bag of skin holding a sack of bones together. When I step barefoot on Thai ceramic floors, the normal left foot feels like it has padding. The nasty right foot feels like bones battling the floor. About a year ago, a major pain developed under a major foot bone and I thought, “Pain with every step. Bone spur. Cancer. Death imminent. Emergency surgery required.” I went to a major orthopedic Thai doctor at a major Thai hospital. He said, “I think it’s a callous. Just file it off regularly.” I said, “Thanks.” (I thought, “Right. I need a second opinion. He doesn’t understand what’s going on under the skin. No X-rays, no comprendo. What does he know?”) Cost: 150 baht = $4.00, which would have cost ten to twenty times as much in America, give or take a hundred. Now I just file it off regularly and the pain is gone. The Thai advice/treatment cost me a total of 300 baht = $8.00. In America, that would have cost $130 for the first two doctors and $150 for the specialist, but I probably would have ended up in surgery for $15,000 plus $100 for pills and $39.95 for special socks to wear after the operation. Even if Dr. USA would have suggested the filing technique, he would have prescribed a special $150 foot file, covered by health insurance that I no longer have. I’m not exaggerating any of these costs. And I probably would have had to see another specialist to buy the file. This story is funny to Americans. It’s funny to me, too, but seriously, it’s just another great reason to live in Thailand, give or take a million. The Public Health Ministry will spend about Bt200 million to establish 300 additional malaria clinics in 30 border provinces this year as the number of the disease patients is still on the rise, Minister Mongkol Na Songkhla said. Dr. Mongkol said a total of 8,567 malaria patients, 4,718 Thais and 3,849 foreigners, were treated during the first three months this year. Most of the patients were found in Tak province bordering Myanmar, followed by the southern provinces of Yala and Songkhla. Health officials have been unable to give proper medical attention to patients in the four southern provinces, including Pattani and Narathiwat, because of the almost daily violence in the area, he said. Most of the clinics will be established in border provinces, particularly along the Thailand-Myanmar border. Currently, there are more than 500 such clinics providing medical services, said Dr. Mongkol.